Soundtrack and merchandise available now! Wargroove’s amazing soundtrack was developed by Pete Lepley (aka Phonetic Hero) and will be distributed by Boss Battle Records. We’ve shared a number of the tracks on our blog and through Youtube, but now the entire Soundtrack is available to pre-order! We’ve been working really closely with Pete throughout the development of the game, and have been so impressed with his work. We can’t wait for everyone to have the opportunity to get their hands on it! We asked Pete and Boss Battle Record’s founder Fabian Malabello to share some thoughts about their work on the project. Pete: I’m a huge fan of Advance Wars, and writing the music for Wargroove was something of a dream project. Albeit challenging, providing additional character for each of the commanders, their factions, and the world of Aurania was my absolute pleasure and I’m deeply proud of all the work that’s gone into the soundtrack. Chucklefish has made something special and incredibly charming in Wargroove, and I’m very grateful to have had the opportunity to aid in its creation. Hope you all enjoy the music! You can preview and pre-order the album now on bandcamp! There’s also a vinyl press of the soundtrack available for pre-order with custom art and a beautiful package produced by our awesomely talented friends at The Yetee. We’d partnered with The Yetee to produce merchandise for both Starbound and Stardew Valley – so when they approached us to brainstorm some merchandise for Wargroove we knew they’d be a great partner. In addition to the vinyl soundtrack, they’ve produced some amazing tee designs, hangable banners with a crest for each faction, sticker sheets of units, and chunky PVC pins for 12 of Wargroove’s commanders! You can view the full product line up on their Wargroove collection page. 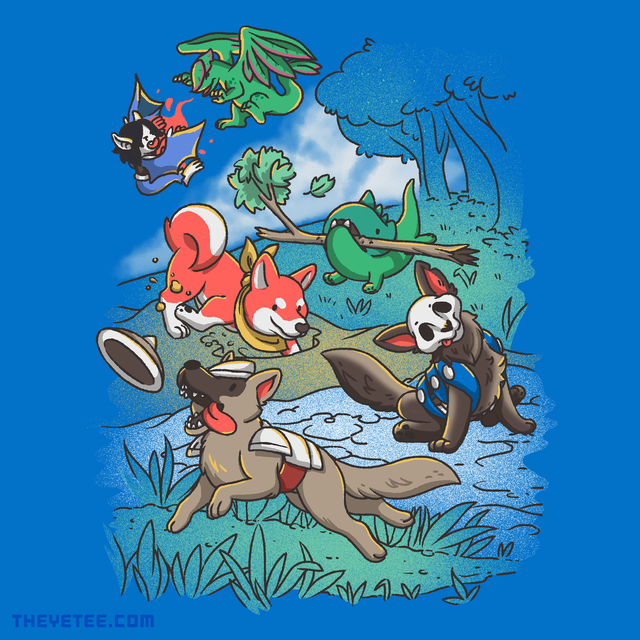 Here’s one of the tee designs – appropriately called ‘PupGroove’ – showing off each faction’s good boys. You can purchase these individually or show your love for a specific faction by bundling products together! We LOVE how these all came out and couldn’t be more excited to share them with you all. We’ve also got these all listed on our shiny new Store Page on the Chucklefish site. We’ll be updating it as we get more products available! !